Every room needs a statement piece and this standing table is sure to impress. Curved, arched legs deliver a modern look while the distressed wood printed top gives a chic appearance; combined to create an on-trend and stylish standing desk that is sure to leave an impact on your guests. The multi-functionality of this table gives you the freedom to use it in any room of the house and not just as a standing desk! The simple lines and clean appearance of the desk make it easy to adjust to your décor aesthetic and leaves you with plenty of design possibilities. A spacious, tempered glass tabletop provides durability as well as plenty of room for your home office needs. Metal legs ensure a stable structure and won’t wobble upon use. Straightforward assembly instructions will assist you in getting your standing height table ready for use in just a half hour or less. Elegant Style: Complete your home office with our simple and sophisticated glass top standing desk. Combined with a chic whitewash wood look and a smooth glass surface, this piece will pair well with your existing furniture to create an overall stylish look. Spacious Surface: A rectangular top measuring 43.25 x 23.5 inches provides plenty of space for working from home with a laptop, notebook and cup of coffee. This standing table allows for unique versatility and can also be used as a vanity table, sofa table and more. Simple Assembly: Easy to follow instructions allow you to assemble your new desk in a half hour or less. Standing Height: At a height of 43 inches tall, stand in comfort while you work. This height also makes well for an entry way table or pair it with bar stools to create a modern kitchen / dining table. Strong Construction: A tempered glass top sustains wear and won’t shatter. Sturdy metal legs combined with stabilizing crossbars ensure a secure and wobble free desktop. * You’re 50% More Productive Standing: Your new standing desk can pretty much pay for itself by all the work you’re getting through. Because the brain relates standing with “action” and sitting with “relaxing” studies show that you are more effective while standing! * You Burn More Calories: While this is not a weight loss miracle – standing can burn an extra 54 calories a day! 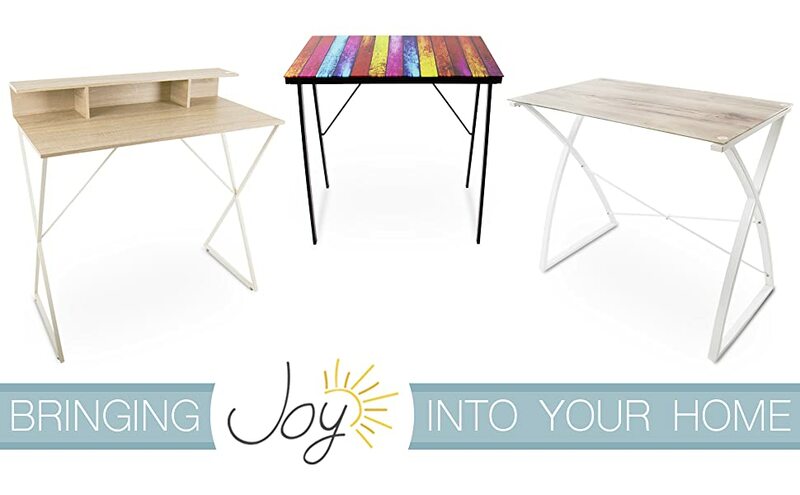 * You Feel More Energized: Improve your mood and gain energy by using a standing desks. Standing desks users report feeling more comfortable, more energized, more focus, and overall happier! * You’ll Work Pain Free: Suffer from neck or back pain? Studies show that people who started standing experienced a 54% reduction in back and neck pain. So, what are you waiting for - will the real Stand Shady please stand up?! Buy in confidence today with Stand Steady’s 100% happiness guarantee. If you are not completely satisfied with your purchase – get a full refund. Start standing today with Stand Steady!